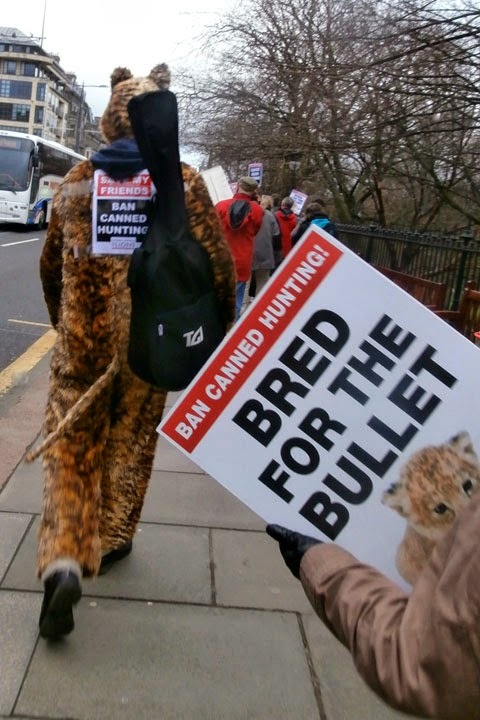 A canned hunt is a trophy hunt in which an animal is kept in a confined area, such as in a fenced-in area, increasing the likelihood of the hunter obtaining a kill. According to one dictionary, a canned hunt is a "hunt for animals that have been raised on game ranches until they are mature enough to be killed for trophy collections." Cubs are taken away at birth so that their mothers can go into estrus again and be ready to have another litter in 6 months (in the wild they would naturally only breed every 2-3 years). The cubs are hand reared and become part of the ever growing cub petting industry until they are too big to be cuddled by humans. South Africa exported 547 of these - bearing in mind that these are only the legally documented exports- probably many more go under the radar. The captive killing of tamed lions (“canned hunting”) is a growing, un-policed industry. Less than 3% of trophy income reaches the local communities. Trophy hunting accounts for only 0.27% of GDP and 1.8% of tourism revenue. Lions have lost over 50% of their historic range in the last 30 years. Nature Conservation will not allow tamed lions to return to the wild, as “human-habituated lions” have lost their fear of humans. The genetics of lions in captive-breeding programs have been compromised, meaning they cannot return to their natural eco-system. Over 160 “Canned Lion” killing camps in South Africa established over the past 15 years. Lion bones are being traded large-scale from captive breeding operations into the Eastern Markets. That's enough information about the facts of canned hunting and I thank you if you got this far! This is something my mum feels passionately about (like everyone should) so when she started talking about the event I knew I had go too. I will admit I was quite nervous because I'm not really the activist type of person and have never been to a march before so I was unsure about what it would be like. It was all okay though because everyone was friendly and all there to support the same cause. 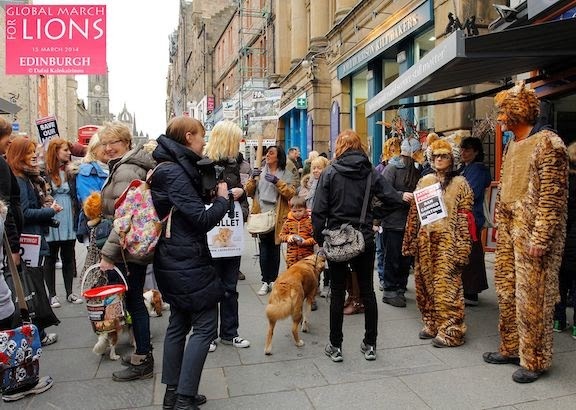 We also got a lot of attention as we talked through Edinburgh with people reading our posters. The march was organised to raise awareness in the general public about what happens in South Africa. A lot of people will see these cubs in captivity and assume that they are part of conservation program but they are not! They are raised by tourists only to be killed by tourists! Lots more information leaflets and posters can be found here if you want to join in the campaign and spread the word. I often say that my readers mean to world to be so if you got this far thank you and there is one more thing you can do! 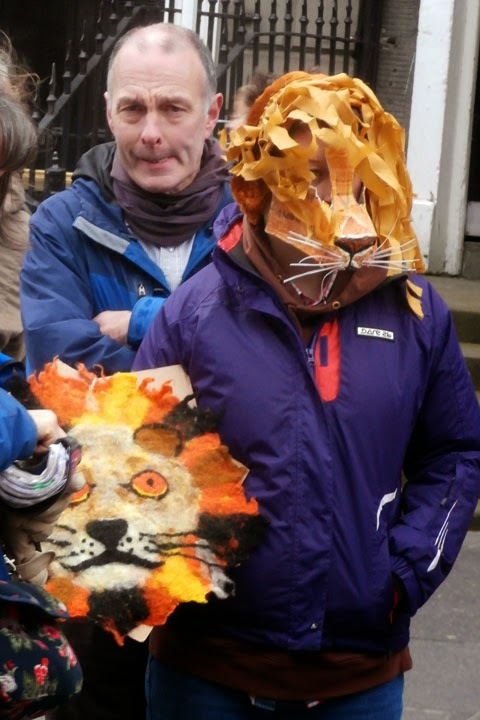 Sign the petition to help get canned hunting banned. If you want to give @ScotlandRoars a follow on twitter too for all the latest info. 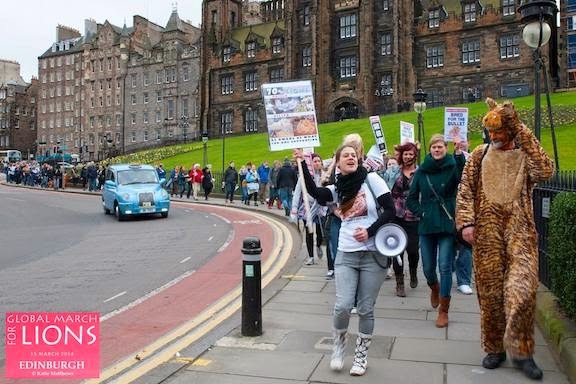 All the photos marked with the global march for lions stamp were taken by Dafni Summer, Katie Matthews & Elina Karadzhova so a huge thanks to Malena for letting me use them!